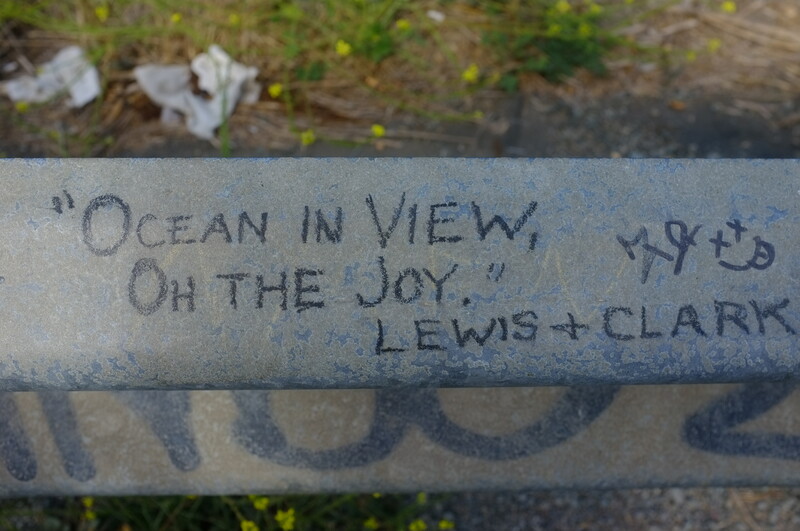 Todays modern world would be as foreign to Captains Lewis and Clark as the west was to them in their time. Yet their thoughts still ring true. As a modern-day explorer, this is all I require: a place to lay my head at night, food, water, company, and the occasional shower. Everything else is a bonus. 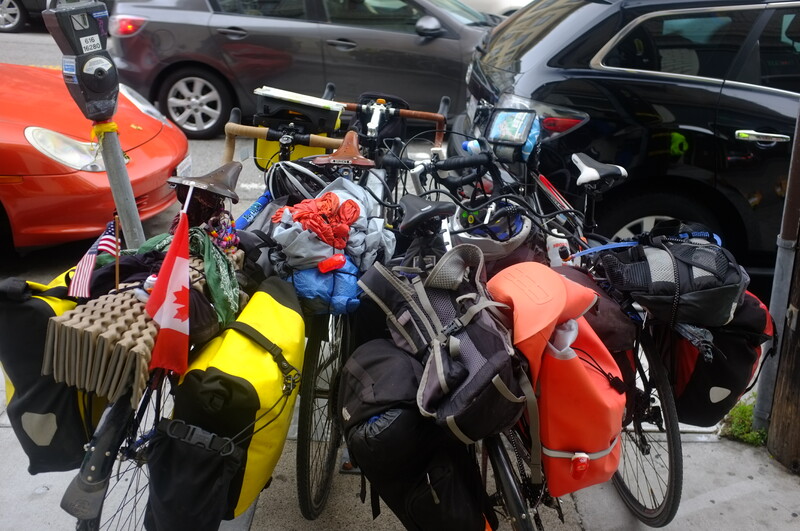 Two days of rest revived the “sperits” of this “waryed, wet, and hungry traveler.” I was excited to be back on the road. I was more excited to be entering my first forest fire. I woke early Saturday morning and tackled the Leggett climb. 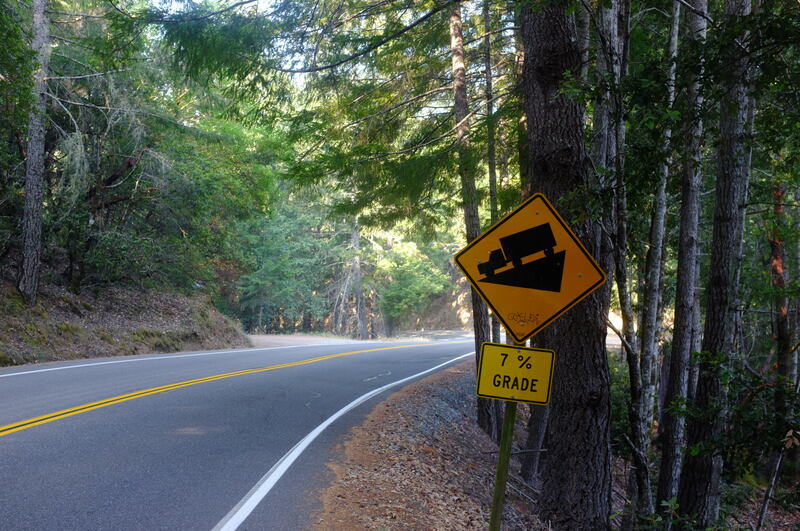 Since the beginning of my journey in Portland, people warned me of this hill. They do not know hills and should spend some time in Pittsburgh! The climb was fun and scenic and, aside from platoons of firetrucks, I had the road to myself. 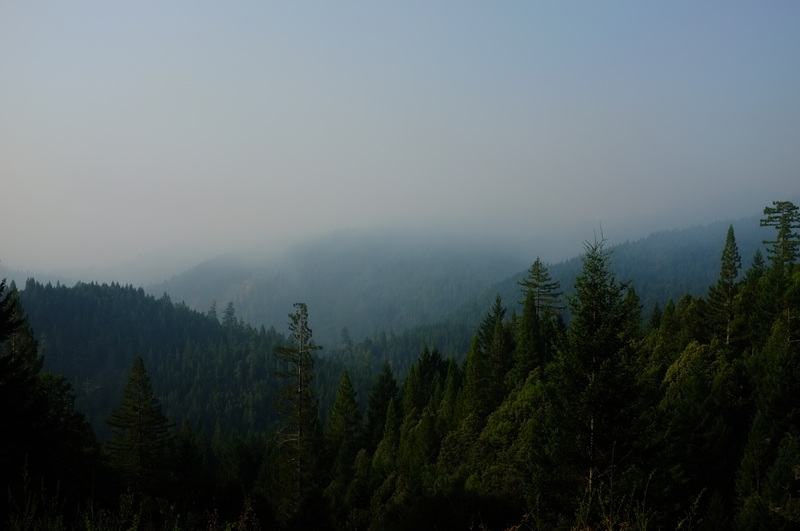 Shortly into the climb, the smoke began perfuming the air like a cedar incense. It wasn’t too thick. My lungs didn’t hurt. My chest did. More of a tightness really and on the left side. If I was an old man, I’d be seriously worried about having a heart attack. The smoke cleared as I bombed down the mountain. I made thirty miles by noon surpassing my 20-by-12 rule. 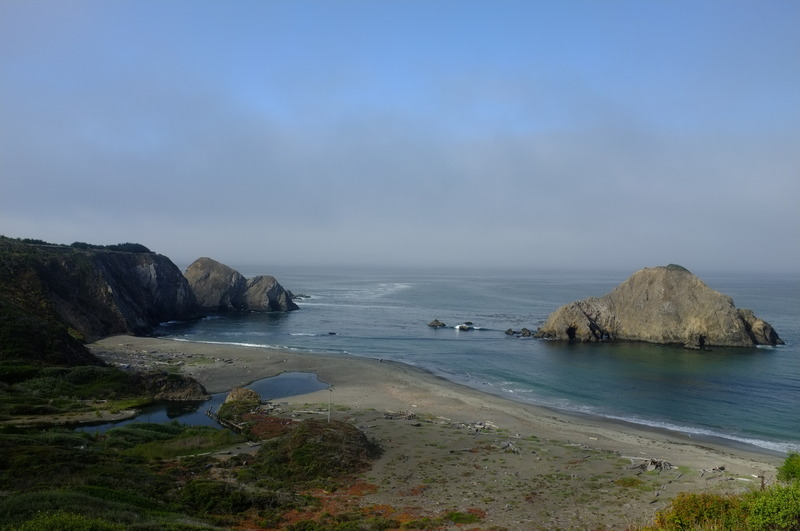 My legs and body felt incredible and I did not stop until I reached Fort Bragg, CA. Passing through this interesting little town, I spotted two large, antlered mule deer. They were behind a chain link fence which I rode up for a closer look. Sitting on a log, was Yoshi. Yoshi is quite the character. You would describe him as homeless, though he is anything but homeless. I spent a few hours learning about the plants and animals of the surrounding forest he calls home captivated by his intelligence. He earns money picking mushrooms and other edibles selling them to local restaurants and farm stands. A security guard sent us on our way. I was sad for the end of my lesson. The next morning, Sunday, was another early morning. I made plans with Charles, a rider I met days before, for a long day. 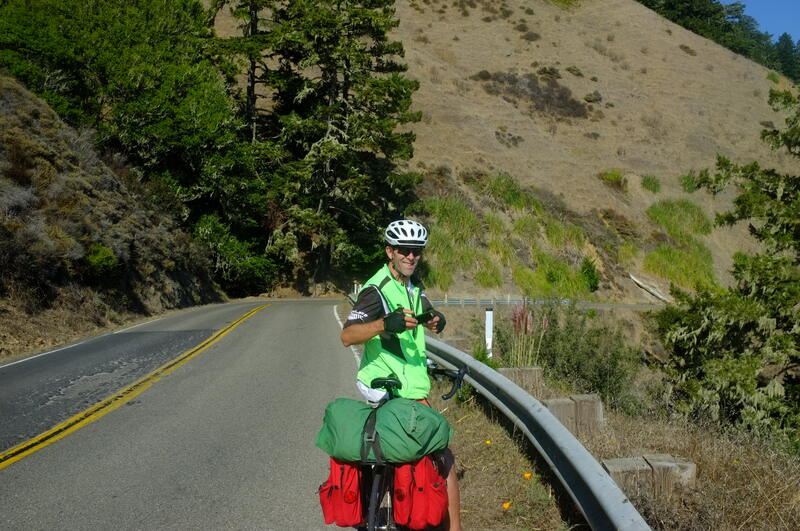 Charles was powering a tandem with his eleven year-old daughter when I first met him. Gabby’s trip ended Saturday and he was now on his own. This turned into one of the best rides of the trip and I pedaled like a maniac. The scenery was fantastic. 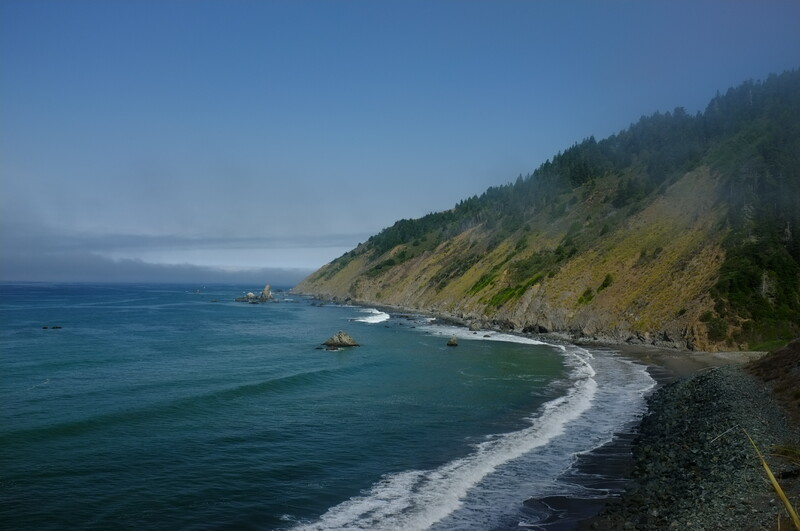 Dramatic cliffs dropped into the bright blue ocean. 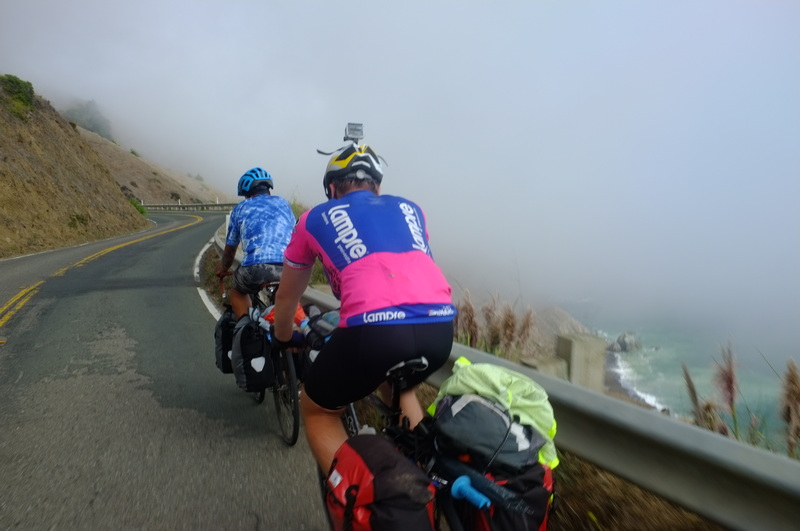 Sweeping descents and sharp switchbacks wound their way around ocean coves. It was foggy. Enough to keep me riding. Not enough to ruin it. Charles is a chatterbox and better than any podcast! I really enjoyed his company on the ride. We pushed hard over 90 miles and riders from last night (Mannix, James, and Brandon) joined our paceline through this beautiful terrain. What’s up Mannix! How you doin? Charles, no longer riding a tandem. After descenting myself, I joined the group for dinner. Anna was here as well and we conversed the night away attempting to avoid our crazy, drunk neighbor and his dog. I have not been using my tent. Instead, I sleep on top of my tent’s footprint. This saves time, not having to assemble the tent, and often affords spectacular views of the nights sky. It cost me some sleep this night. Sometime in the middle of the night, our crazy neighbor’s dog charged a raccoon and chased it up a tree right next to my head, both uttering truly awful noises. “WHAT THE F*CK!! !” I shouted sitting bolt upright. 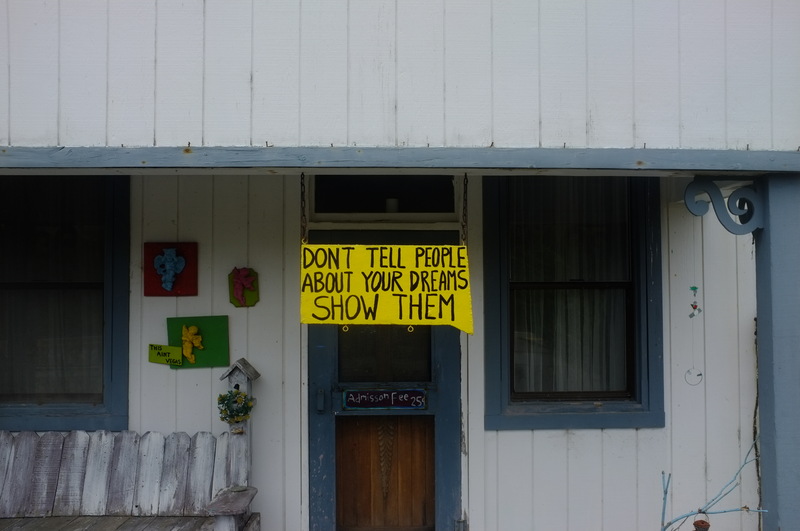 It was a frightening experience and a rather rude awakening as you can probably imagine. I did not sleep well AT ALL. Regardless of my miserable nights sleep, we hit the road early the next morning (Monday). We were all very excited to cross the Golden Gate Bridge and enter the city of San Fransisco. 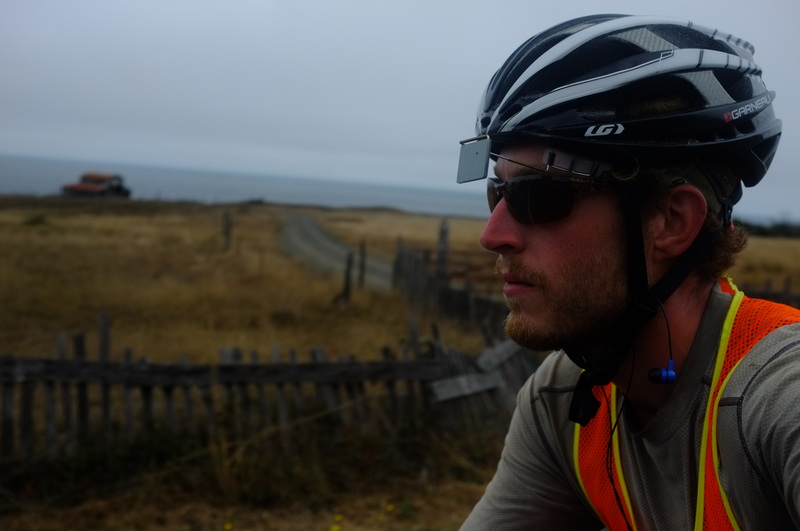 I took the first pull into the wind.We quickly knocked off the first thirty miles. Police sirens and passing ambulances were the first sign of entering the city. Sounds I had not heard since leaving Seattle, WA. Luckily, we had a tour guide. Charles knows the city well and sent us in the right direction before splitting off. His wife picked him up nearby. From right to left: Mannix, Anna, James, and myself. Brandon rode on having lived here previously. 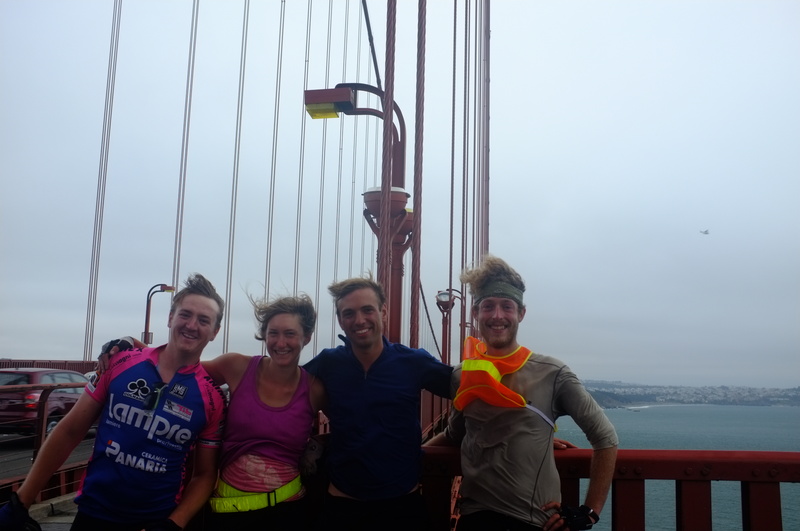 Just before the bridge, we caught up with Anna and the five of us crossed the Golden Gate Bridge. The wind up there was intense and was close to blowing us off our bikes. We stopped for some photo ops and together we celebrated our arrival to San Fransisco. For James, the bridge was his finishing line. His trip is over. The rest of us will be carrying on after a brief layover in the city. Charles has kindly invited me to crash at his place, an offer I could not refuse. Days later, I still cannot believe I made it to this incredible city. I treated myself to dinner and a beer at the Rogue brewery with James, Brandon, and Mannix. I ordered a bacon cheese burger and a PBR. Best meal EVER!!! 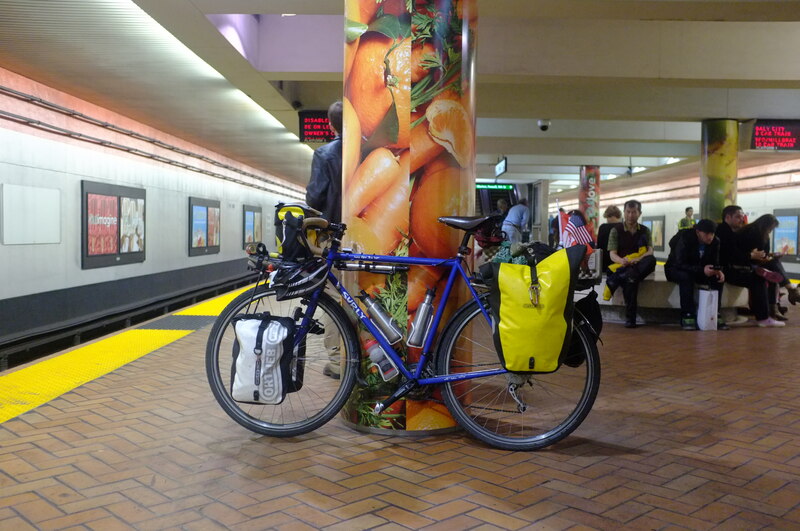 I rode to the hostel and said goodbye to the group then took the subway to meet up with Charles. That is not fog. That’s smoke from the very large and uncontrolled forest fire raging between 101 and the 1. It’s all down hill from here!!! 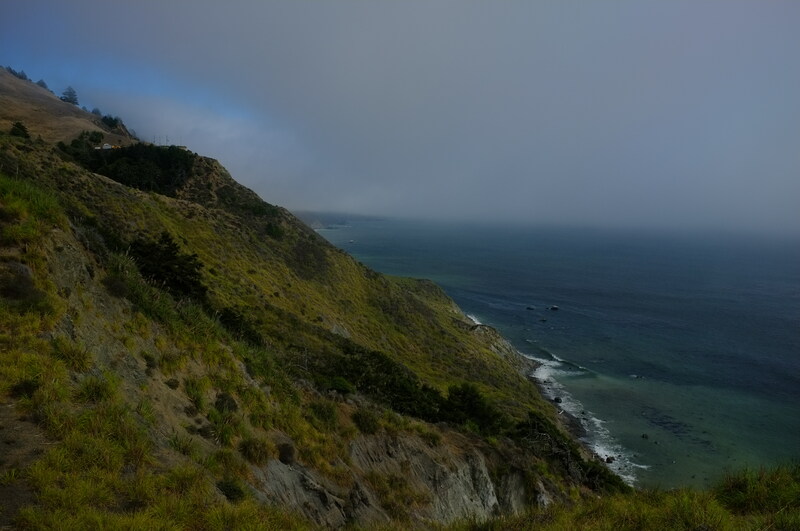 One of the many spectacular views of the Pacific Ocean along Highway 1. These coves created an incredible downhill section with a tight switchback at the bottom. They were super fun but tiring. A very hilly days ride. With some intense climbs mixed in. Our group ascends my favorite part of the ride. These cliffs afford some incredible views. Don’t fall off! The gaurd-rail dissapears shortly. We made it across the Golden Gate Bridge and into San Fransisco!!!!!! Anna, Brandon, James, Mannix, Me. 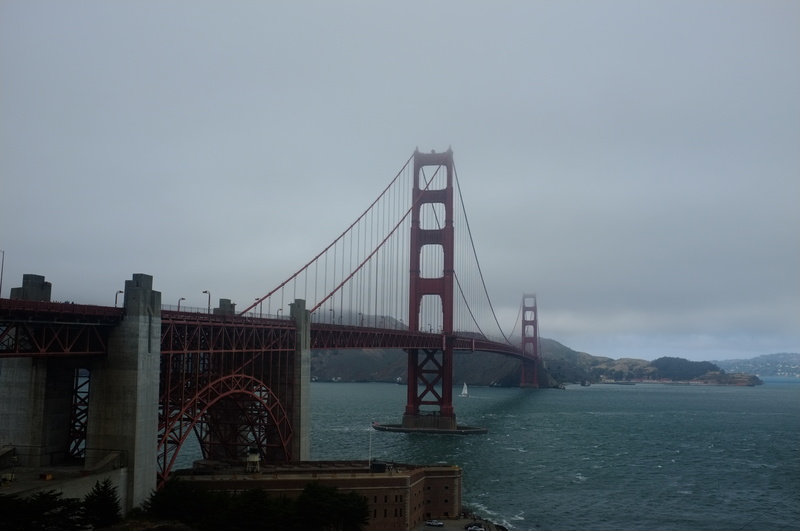 The Golden Gate Bridge in all its glory. The pile of bikes as we treat ourselves to a meal and a beer (or two!). Time to board the subway. 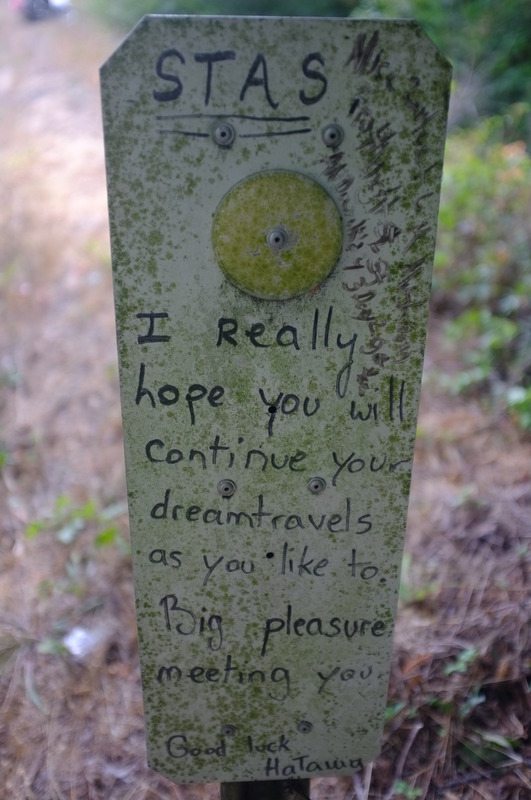 I am really enjoying your posts, fun to hear of your experiences and about all the good people you are meeting along the way. It seems very appropriate to be reading the exploits of Lewis and Clark in Undaunted Courage. I’m glad! The people are the best part. 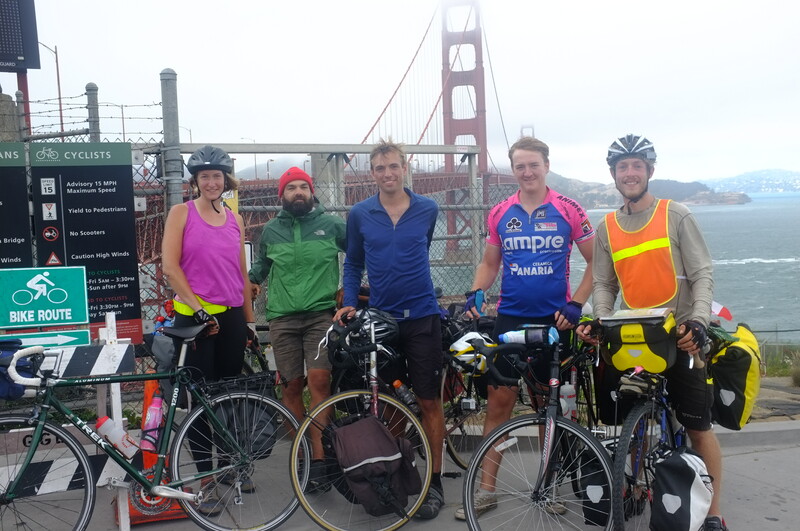 Their is nothing like a bike tour to restore faith in humanity. It is an inspiring read. Wow! Amazing. Where are you headed next? You know, I’m not really sure! Back across the Golden Gate, then south down the one. 70 miles? I’m in a private campground below the bridge. Only four sites here. Apparently you are supposed to reserve it months in advance. 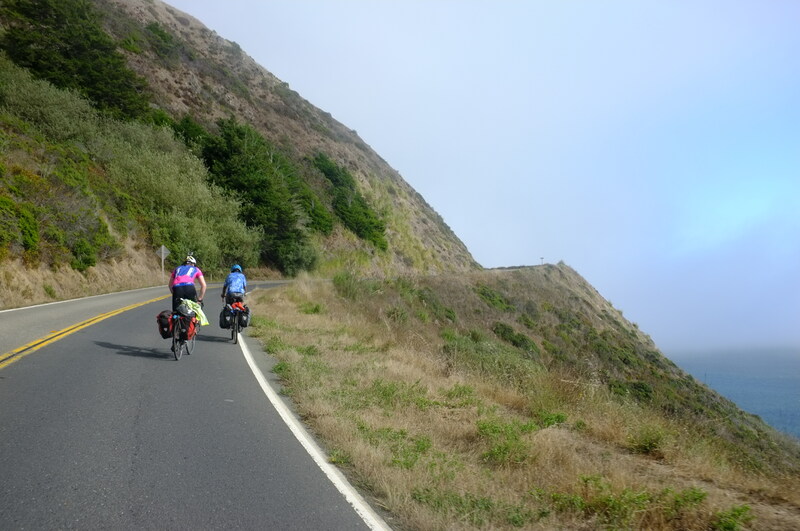 Have you ridden through the Red Wood National Forest yet? I have. And the Avenue of the Giants.